Partial vs. Full transit of Panama Canal? 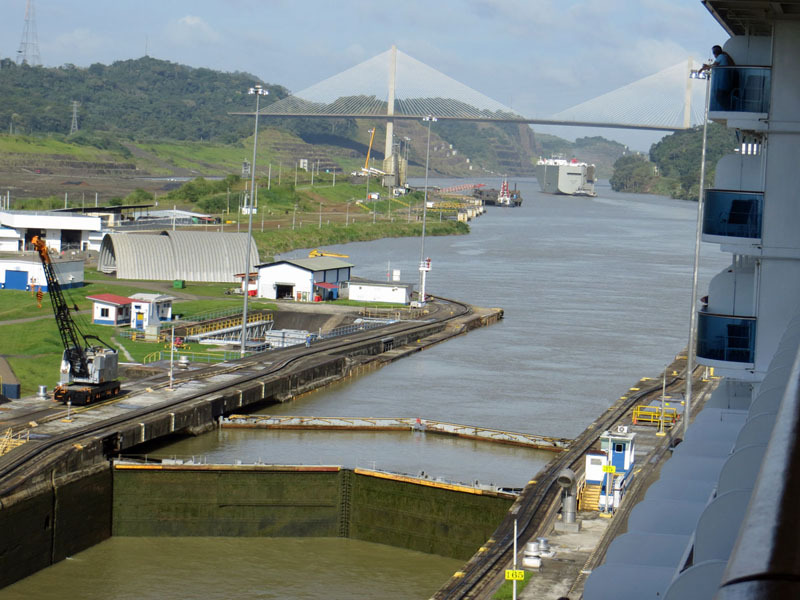 The best time of year to cruise Panama Canal? Travel in comfort on your air conditioned, 4 to 5 star cruise ship (hotel). Locks are 1,050 ft. long and 110 ft. wide. The Coral Princess ship is 106 feet wide. As shown on the map (below), the canal is 48 miles long between Panama City and Colon. Sailing from the Pacific, your first view is the skyscrapers in Panama City. Pass under Bridge of the Americas, a key part of the Pan-American Highway, and sail through Miraflores and Pedro Miguel locks raising the ship 85 feet above sea level. Enter Gaillard (Culebra) Cut, the most challenging part of the canal excavated through mountains at the continental divide to 45 feet below the river surface. Sail past Centennial Bridge and scenic views of the landscape to Gamboa where the Chagres River flows down from the mountains bringing water from Madden Lake into the canal and Gatun Lake. You'll see working dredges where the canal twists and turns to the west. Sail past several small islands in the the 164 square mile Gatun Lake. ​The lake surface is 85 feet above sea level, but lake depth is less than 45 feet. Gatun Lake provides tropical rainwater by gravity flow to fill locks which are then emptied to the oceans. Pass through the three-step set of Gatun Locks to lower your ship 85 feet to sea level in the Atlantic Ocean. My photo tour summary (below) describes sailing north from Panama City. I highlight where the best photo opportunities are, whether the site is on the east or west side of the canal, the best vantage point/perspective for photos, and when your ship will pass that point in the canal relative to a ship entering Panama Canal at Bridge of the Americas at 6:53 am heading to the Atlantic. I've included GPS Latitude, Longitude coordinates for my photos. You can use these coordinates to study the multitude of great photos in Google and Google Earth maps to review the possibilities and plan your photo shoot of the canal. Taken outside on the highest deck level for an unobstructed view. Miraflores Locks raise northbound ships 56 feet. Many passengers stand on the open deck behind the glass. I prefer a higher deck for an unobstructed view. With my 10x zoom, I can photograph any important site or detail. The ship travels at one or two knots in the lock area. Early morning photos were taken in hazy, poor lighting conditions. I took several photos of the Panama City skyline. The foreground near the canal was dark and the city skyline was back-lighted producing a hazy silhouette of the skyscrapers. Fortunately, lighting improved dramatically as we approached Pedro Miguel Locks. Approaching Pedro Miguel Locks Centennial Bridge is north of the locks. Photo taken from open, upper deck. ​This photo was taken from our cabin when there was a ship in the locks on our cabin (port) side of our ship. There will be ship beside you in the locks. It's best to go to the side of your ship next to the cargo ship in the locks. Look for a ship that is approaching the locks. 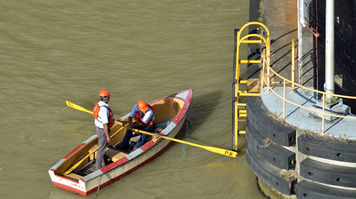 You will see men in row boats carrying lines to connect with lines thrown from the bow of the cargo ship entering the locks. It's interesting to watch this process. You can also watch how the lines are connected to the locomotives and you can get good photos of tugboats pushing ships into the locks. ​Photo (below) taken from our port side cabin. Note the locomotive at the top of the sloped train track with lines tied to the stern of the cargo ship. Photo taken from our cabin looking north. 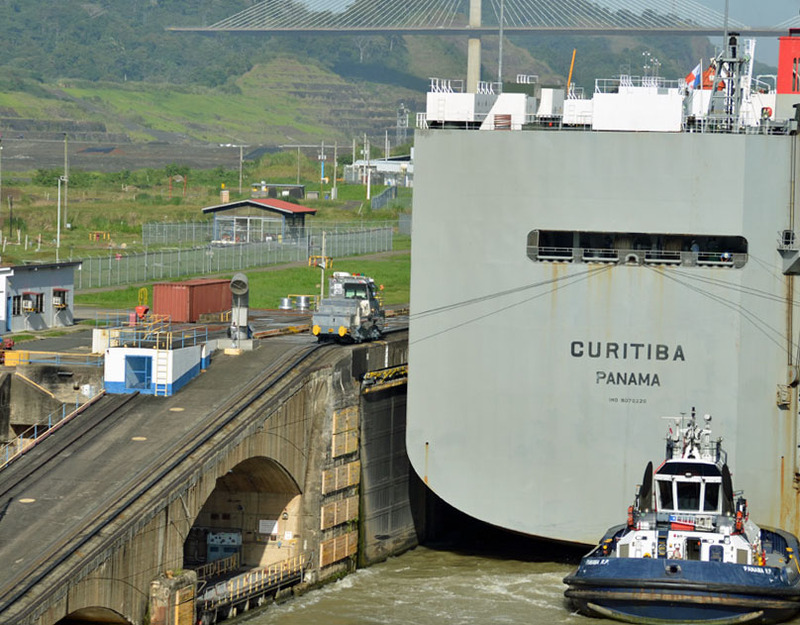 Gaillard Cut begins at Pedro Miguel Locks and continues north to Gamboa. Gaillard Cut is a man-made valley cut through the continental divide. It is also called Culebra (Snake Cut) because of turns in the canal. This was the most challenging area of construction to build the canal. Water had to be diverted away so that workers could dig a canal from the top of the hills to a depth 45 feet below the river surface water level. The soil was unstable; earth and mud slides were a constant problem during construction. There are many photo opportunities. This is the place to be on the upper, open deck of your ship to have unrestricted views of both sides of the canal. You will see evidence of how the landscape was cut back, moved away from the canal, and tiered to reduce the likelihood of landslides. As you sail north of Gamboa, you'll see dredges working near the twists and turns as the canal turns to the west approaching Gatun Lake. Once we reached Gatun Lake there were few things to photograph. I could see Gatun Lake and the islands through the large windows on the ship and felt that I was not missing anything. ﻿﻿For a partial transit, take a Caribbean cruise to Colon. Most cruise ships sail through Gatun Locks. Some sail around in Gatun Lake and then pass through the locks back to the Atlantic. Some ships anchor in Gatun Lake and tender passengers ashore for boat tours of the lake or a partial transit of the canal. Cruise ships pass through Gatun Locks into the lake. You take the ship's tender ashore to join these excursions. NOTE: This catamaran boat tour only covers part of Gatun Lake. subject to change depending on the number of people on the tour. Board a bus at Gatun Yacht Club in Colon for a one hour, 46 mile drive to the dock in Gamboa. Board a ferry boat to sail ~ 3.5 hours from Gamboa, through Gaillard Cut, under Centennial Bridge, through Pedro Miguel Locks, Miraflores Locks, past Bridge of the Americas to La Playita Marina in Panama City. Board a bus for ~105 minute ride back to Colon. Reviews of this tour on Cruise Critic and Trip Adviser are positive. People love this tour. It's a good alternative to a full transit of the canal. On this ferry boat tour, you'll see the most important areas in Panama Canal. 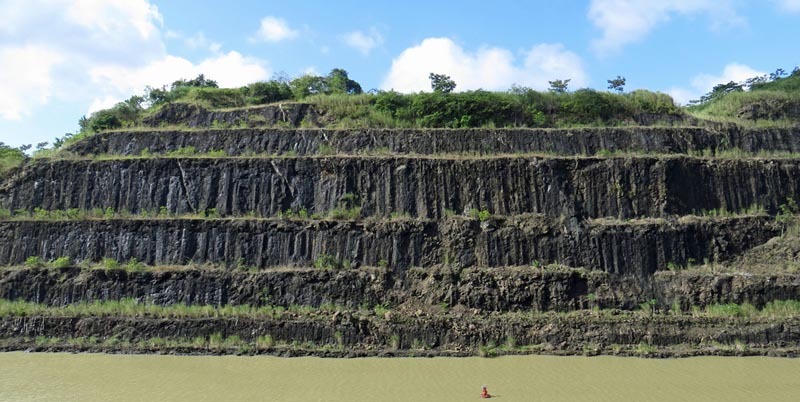 You won't see the working dredges and islands in Gatun Lake, but that's not a big deal. FULL TRANSIT of Panama Canal on a Ferry Boat vs. a Cruise Ship? You can independently plan a 3-day vacation with a full transit of the canal on a ferry boat. Fly to Panama City the day before. Round trip airfare Ft Lauderdale to Panama City is ~ $ 1500 per person. Take a 10-11 hour ferry boat full transit from Panama City to Colon for ~ $ 250/person. Ride a bus ~105 minutes back to Panama City. Many people sail a full transit on these ferry boats and love it. The largest ferry boats are 119 ft. long, 25 ft. wide, and have 300 passenger capacity. The enclosed lower decks are air conditioned. There is open-air seating on the upper deck and bow. boat is long enough for me. I wouldn't want to spend 10 hours on a 300 passenger ferry boat. On a cruise ship, I have unlimited access to open decks for photos of the canal from different perspectives. I'm always next to air conditioned areas, shade from the sun, and access to all the creature comforts e. g., grab a cup of my favorite latte, sit on a deck chair, my balcony, enjoy superb buffets, dining rooms, lounges, etc. with large windows and open areas to view the canal. If you're mobility challenged or in a wheelchair, a cruise ship is “the perfect way” to see the canal. ​Coral Princess is a 4 to 5 star floating hotel. I sail the canal without disrupting my daily routine - reading emails, meeting friends for drinks, and enjoying a fantastic dinner followed by superb entertainment. December through early April is the “dry season”. Panama has a tropical climate with 75-85 F temperatures and high humidity year-round. Wear a hat, sunglasses, sunscreen, and carry water. I disagree. These concerns do not apply to a vacation on a cruise ship. When a cruise ship docks, thousands of passengers disembark to tour the area and spend money. Business owners open shops and restaurants for the high volume of customers. I believe Sundays and holidays may be the “best time” to tour cruise ports on a Panama Canal cruise. Residents are at home, so streets are not crowded. Hence, there are fewer people in the background of my photos. ​Banks are closed, but I don't need a bank in Panama. The “official” currency is the “Balboa”, but US dollars or credit cards are accepted everywhere. Which way to sail – Pacific to Atlantic or vice versa? The ports of call are similar, but there are some differences sailing from California to Florida or vice versa. In our case, we wanted to visit Costa Rica, Panama City not Colon, Cartagena, and Aruba. The direction you sail through the canal does ​NOT affect what you see and can photograph. ​If you are concerned about location of the sun relative to your cabin, look at the map of the canal. Most of the 48 mile long canal and all of the locks run north-south. For taking photos in the locks, it's best to be on the side of your ship where you can see a ship beside you to photograph activities in the locks. In Miraflores locks, there was a cargo ship on our starboard side. There was not much to see from our port side cabin, so I went to the upper, open deck for photos. In Pedro Miguel locks, there was a cargo ship on our port side; I could take great photos of lock activities from our cabin. In the Gaillard Cut, there are photo opportunities on both sides of the ship. I went to the open, upper deck for unrestricted views of both sides of the canal. Photo tour guides on shore excursions with descriptions of the sites. NOTE: Port guides are listed below in the order they appear on the map from Los Angeles to Ft Lauderdale. These ports are 25 miles from Los Angeles (LAX) airport. My guide has maps and information on transit options from the airport. Los Angeles Port is also called “San Pedro” and “World Cruise Center”. Long Beach Port is also called “Carnival Cruise Terminal”. The ports are shown on the map at left. Driving distance between these ports is seven miles. I've included information on renting a car at the airport assuming you'll want to spend a few days vacationing in Southern California before or after your cruise. 1) Long Beach is an upscale, clean, well manicured convention center area with many things to see and do. Restaurants and tourist attractions are abundant. 2) There's an Avis car rental in Long Beach where I dropped the car off the morning of our cruise and took a short, 6 mile taxi ride to our cruise ship. We did day trips from our hotel. I particularly liked our driving tour of Joshua Tree National Park. US National Parks are gorgeous. My frustration is that I can't find detailed driving tour guides for the parks. Hence, I drive around, occasionally getting lost, to “discover” what there is to see and photograph. As I drove through the park, I took photos and recorded GPS coordinates for all the scenic areas, major rock formations, road pull-offs, campgrounds, visitor centers, etc. ​Since I had all that data, I decided to write a Joshua Tree Driving Tour Guide. This guide should help anyone who wants to plan a driving tour and photo shoot of the park. Here are some photos in the cactus garden. Cholla Cactus Garden GPS = N 33° 55' 31.36", W 115° 55' 44.73"
These two cruise ports are 12 miles apart. It doesn't make any difference which port your ship docks at because there is nothing of significance close to the docks. You'll need transportation to the tourist sites. Costa Rica is a “paradise” of spectacular, unspoiled natural beauty. Flora and fauna are superb. I'm not a bird watcher, but can you imagine the excitement if you could get a glimpse of, or better yet, photograph the Resplendent Quetzal (photo at right)? It's one of the most beautiful birds in the world and it lives in Costa Rica. In my opinion, Costa Rica is the best area to visit on a Panama Cruise. Go out to the country, away from your ship to see the mountains, volcanoes, rain forests, rivers, lakes, coffee plantations, wild life, plants, flowers, etc. Take the longest ship's tour you can to see and experience as much of the country as possible. Meet the people and enjoy a fantastic family style lunch. Our ship's bus tour included La Luisa coffee plantation, Poas Volcano National Park, and lunch at Restaurante Freddo Fresas. ​Then we drove through the town of Grecia and stopped at Sarchi which is famous for hand made and painted wood products and it has one of the most beautiful churches in Costa Rica. Think of your ship's tour as a preview for a vacation that you have to spend in Costa Rica. Vacationing in Costa Rica is top on my bucket list. ​When planning cruises, I check travel safety published by the US Dept of State, the UK, and Australia. I prefer travel advice from the Brits and Aussies because they “tell it like it is”. Don’t carry valuables or sums of cash. Be vigilant at ATMs, people have been attacked after withdrawing cash. Beware of pickpockets. In Panama City, watch out for muggers in the main shopping areas of Via España and Avenida Central, the area of Calidonia, the main tourist site of Old Town (Casco Viejo), and the popular tourist site of the Old Panama ruins (Panama Viejo). In Colon City, street crime and drug usage are high. NOTE: Safety is a personal issue. Please DO NOT consider MY BELIEFS on travel safety as a recommendation. Determine what is safe for you. Make your travel plans for your preferences and your risk tolerance. There are three touring options from the parking lot in front of the marina where cruise ship tenders dock; namely, 1) HopOn bus, 2) Ship's excursion bus, and 3) Private taxi tours. I avoided the hop on bus due to concern of standing on street corners at bus stops and walking alone in unfamiliar, high crime areas. I wanted to tour with a local guide who knew the area well, spoke the language, and carried a cell phone. The ship's tour bus and a private taxi met my criteria. The advantage of the taxi tour is that it is a personal tour, the driver will adjust the tour to my preferences. ​We loved the taxi tour and felt safe. See the map of our taxi tour at right. Our driver pointed out various tourist sites and places we could stop to visit. It was like selecting from a “menu” of sites to personalize our tour. He was also keen to find places where he could stop for me to take photos. He parked the car and walked with us in the Old Town (Casco Viejo) explaining the sites. We saw everything we wanted to see and really enjoyed it. Most of my friends took taxi tours of different duration to visit sites of interest to them. The consensus was that all of us enjoyed our taxi tours as an excellent way to personalize our shore excursions in Panama City. From a travel safety standpoint, Cartagena was listed as having a modest crime rate. Travel advice was to call for an “official” taxi rather than waive for a cab off the street. It's too far to walk from the ship's dock to tourist sites. Tour options are 1) the ship's excursion bus, 2) the HopOn bus, and 3) a pre-arranged private tour. All were acceptable for travel safety, but I wanted to walk with a guide to explain the sites. We joined a pre-arranged private tour via Cruise Critic Roll Calls. ​We rode in a small bus to most of the popular tourist sites, walked through the Old City, visited the Joyeria Caribe Emerald Museum-Factory, and the main shopping areas. It was Christmas Day. There was no one on the streets that would be distracting background in my photos of the colorful buildings (photo at right). Squares and cafes were not crowded. Churches were decorated with flowers. Lighting was perfect for photos. Unlike much of the Caribbean, Aruba has a dry climate and an arid, cactus-strewn landscape. Visitors can expect warm, sunny weather. Year-round temperatures range from 76 to 91 F with ~ 77% relative humidity and low rainfall. Often, there is a gentle breeze making it very comfortable. The island is clean, safe, and well suited for self-guided touring. The gorgeous, white sandy beaches are north of the port in the upscale hotel-resort area. It's too far to walk. Take a bus for ~ $ 2.30 cash USD or take a cab. My Aruba guide includes 1) Maps of cruise ship docks in downtown Oranjestad, 2) Directories for the malls. It's a shopping paradise with duty-free pricing on international brand names, 3) Bus routes, and 4) A tour of the island with maps, GPS coordinates, photos, and descriptions of the sites. See photos at left. Sonny picked us up at our cruise terminal at a pre-defined time carrying the sign for his company so we could spot him. We boarded the air conditioned bus, sat back and relaxed, as Sonny explained the sites and answered questions. He made several stops where we could get out walk around and take photos. On the way back to the ship, he dropped some people off at beaches or shopping centers. Those people take a cab or public bus back to their ship. This guide includes maps and details of Fort Lauderdale Port Everglades cruise port showing location of 29 docks, the cruise terminals, parking, security gates, etc. with information on transport to/from the airport, where to buy wine, and pre-post cruise tours of the area if you have extra time before your flight or cruise. Port Everglades is one of the largest cruise ports in the US. It has 12 cruise passenger terminals, 2 parking garages with 2 lots, and 29 docks for cruise and cargo ships. Tip: If you are arriving on a ship and transferring to another ship in the port, be sure to ask your cruise line to make the transfer for you. It's too far to walk between docks and the taxi drivers don't want a low cost, short ride fare between ships in the port. They want a higher paying fare to the airport. Copyright 2017 Thomas Sheridan ﻿www.TomsPortGuides.com﻿ All rights reserved. 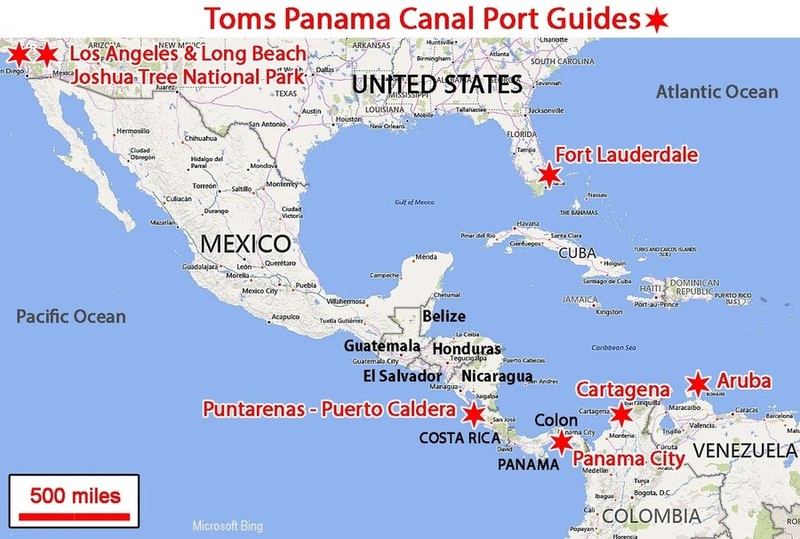 Planning a Panama Canal Cruise?